A bedroom is not only a place to sleep; it can be a refuge from the bustle of the rest of the house. There is also the need to see into dark corners like in dresser drawers and closets. Don’t forget to use layers of light. 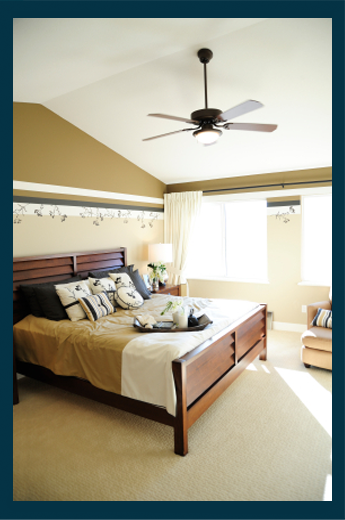 We recommend overhead lighting – a ceiling fan or chandelier – as well as table or floor lamps. What size should my bedside table lamps be? The size of the lamps should be comparable scale to the size of the headboard and end tables being used. For instance, small lamps will be "lost" next to a large, dominant headboard. What other ways can I have bedside lighting? Swing arm wall lights add a decorative element and allow one person to read without disturbing the other. To avoid glare, install them so the shades are about 22 inches away from the mattress. Pendants, track and recessed lighting are other ways to add reading light and a touch of high style to your room.